As promised, here is Paper Jewelry Round Up Part Deux - the Colorful Version. You'll find the Black and White post here. First up, Jennifer Merchant of Minneapolis/St. 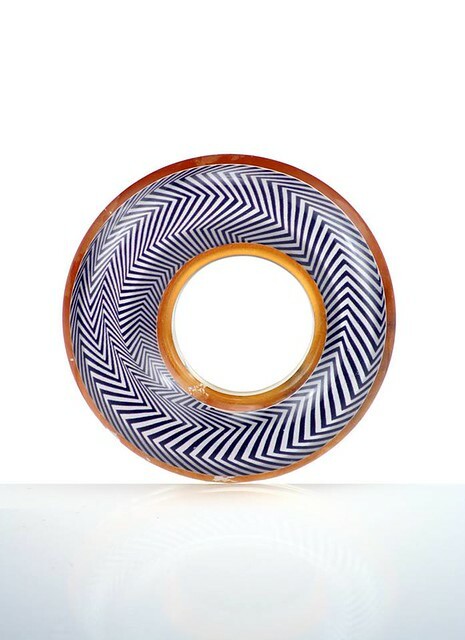 Paul studied metalsmithing at Savannah College of Art and Design and has chosen to work primarily with alternative materials, such as acrylic, images torn from books and magazines, and Corian to create pop art-inspired, geometric jewelry. 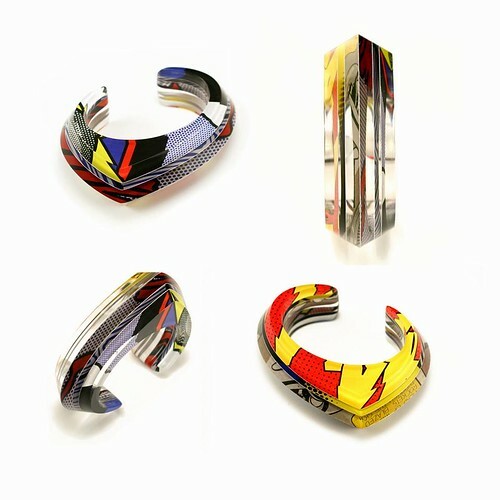 Each uniquely impressive art piece, such as this Lichtenstein Collection cuff bracelet, is made by hand, a labor-intensive process but one that Jennifer enjoys. She created this Blaze Brooch as part of a new collection called Opulent Illusions. Jennifer designs and prints optical illusions and sandwiches them between layers of acrylic with 14k gold and 23k gold leaf foil accents. The collection can be seen at Facere Jewelry Art Gallery in Seattle as part of the new show, Matter of Material. Raya Sader Bujana of Barcelona, Spain and Etsy shop Little Ray of Sunflower studied architecture and prides herself in "being able to see art in discarded things." She folded this tessellated paper medallion from a magazine image of lemons and leaves. Even the brass necklace chain was sourced from a vintage chandelier that she took apart. Raya found a novel way to use a pair of origami lucky stars. 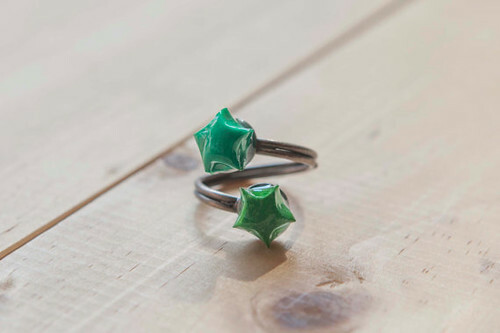 Each tiny star - only 1/4" in diameter! - is attached to an old ring setting. 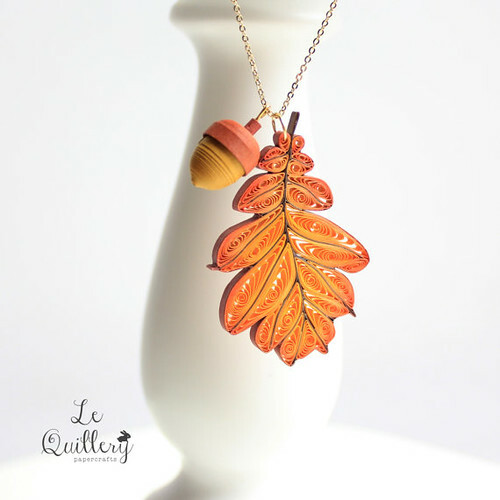 It's way too early to be showcasing an autumn oak leaf, but the color shading in this quilled version with a paper acorn is so pretty I can't help myself. It was made by Kai Garber of Germany and owner of Etsy shop Le Quillery. Kai makes a wide variety of rolled and folded paper jewelry. 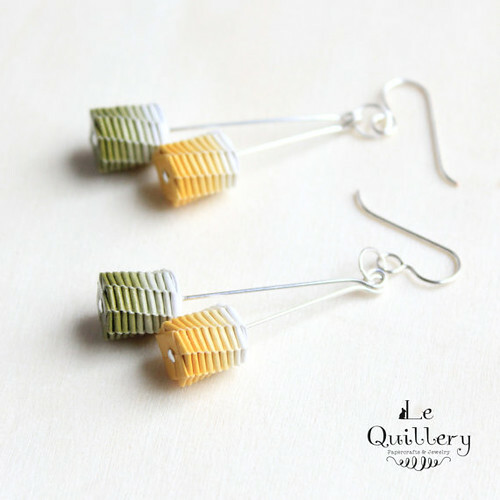 These graduated color woven earrings look light and summery. All of her pieces are protected with water-resistant varnish. Devi Chand in Chennai, India is a life-long maker who studied Accessory Design at the National Institute of Fashion Technology. 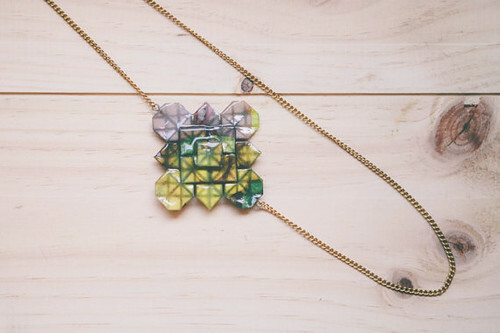 Her Etsy shop, Paper Melon, features jewelry made with upcycled paper and cardboard. 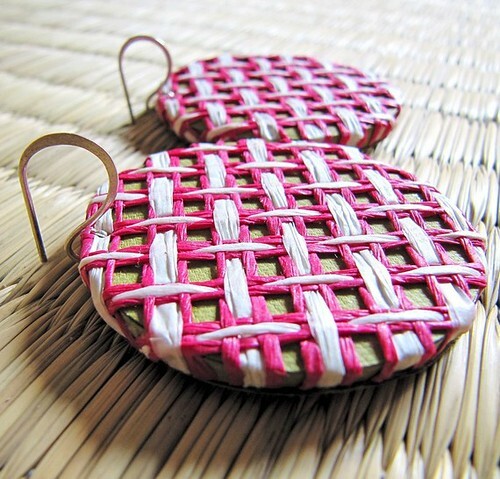 To create this pair of lightweight earrings, she wove pink craft paper around cardboard discs that are covered with olive green paper. 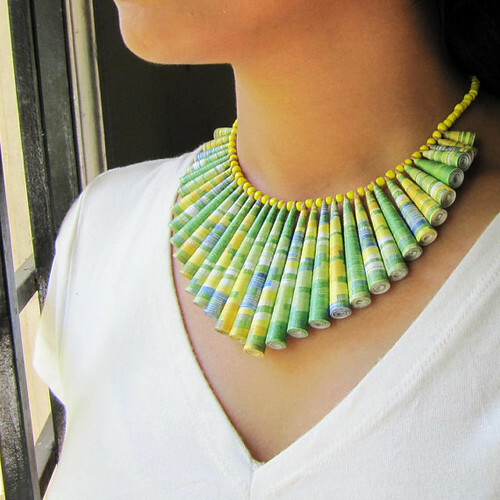 Devi calls this pretty paper and glass bead necklace Lemon Mint Cooler as it is composed of the colors of her favorite summer drink. 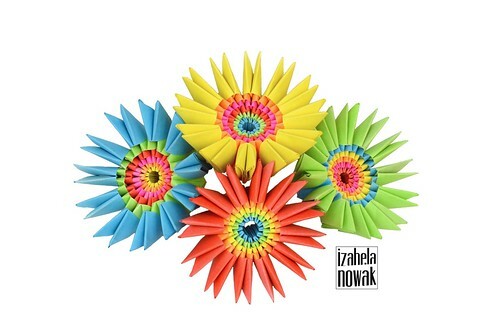 Izabela Nowak is a polymer clay artist who enjoys origami and uses her skills to make upycled paper jewelry. Originally from Poland, Izabela now lives in Vienna, Austria where she teaches others to find their own creativity. Check out her blog for origami tutorials. Izabela made this eye-catching necklace by combining polymer clay beads with discs cut from milk and juice boxes. Debbie of New York and The Creative Bee Etsy shop creates jewelry from paper, wood, felt and glass beads. 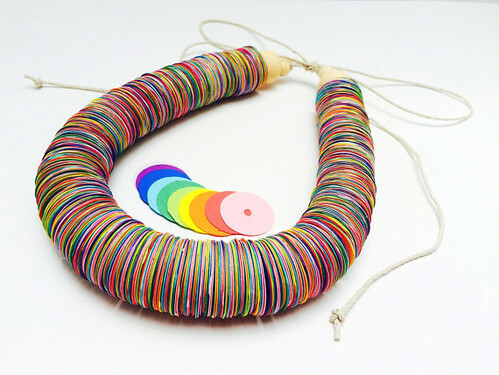 I'm admiring the color shading in this necklace that is made up of paper discs with finely scalloped edges. In need of a little summer project? Another very cool item that Debbie offers is a paper disc necklace kit. There are five color choices and each kit contains 1250(!) 1" card stock discs with holes for stringing, hemp cord, wooden beads and instructions. 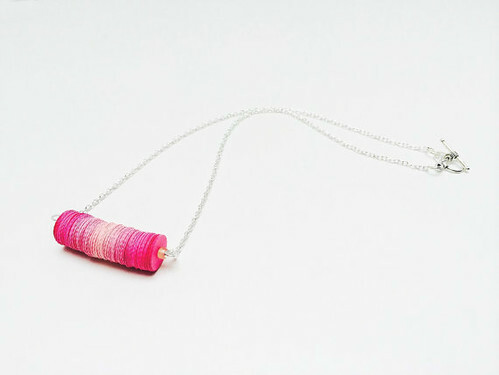 Ann, Thanks so much for including my paper necklaces on your wonderful site!